Synopsis: Most sixteen-year-olds shouldn’t know where museums keep their rarest jewels (the basement) and they really shouldn’t know that vans make the worst getaway cars. 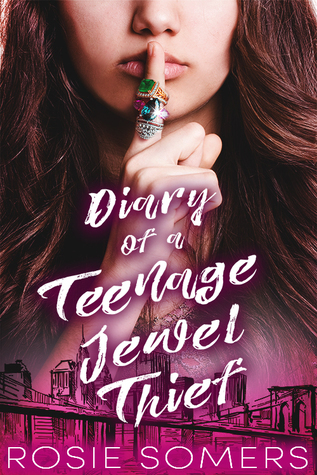 But for Marisol Flores, a life of jewel thievery is a birthright handed down from generation to generation, even if she didn’t ask for it. So when a rival thief targets Mari and her mother, Mari’s more than happy to flee to the anonymity of bustling New York City. Disclaimer: I was provided a free ARC in exchange of an honest review. Thank you "Entangled Teen" for the opportunity to review this book. I'm going to get straight to the point. I did not really enjoy this book. I feel like it had potential, but it fell very short. The synopsis is very misleading as the main plot happens in just the last 1/3 of the book. Most of the book feels like a contemporary, which would be fine and dandy if this was actually a contemporary novel, but it isn't, and the romance feels out of place and very insta-lovey. The main characters weren't enjoyable to read. Matter of fact, I really wasn't a fan of the narrator, Mari. She is so incredibly naive and stupid for a girl who is supposedly a master jewel thief. The writing was very basic and the plot was cookie cutter basic. The only reason why I'm giving this two stars and not ones is because there were a few cute moments that I liked. It's a shame. I really wanted to like this book because the premise sounded interesting and kind of reminded me of "Heist Society" by Ally Carter which is one of my favorite series from when I was in middle school, but this comes no where near as good as Ally Carter's books. Overall I'm glad this was a quick read and didn't take up too much of my time and this is not a book I would recommend at all.